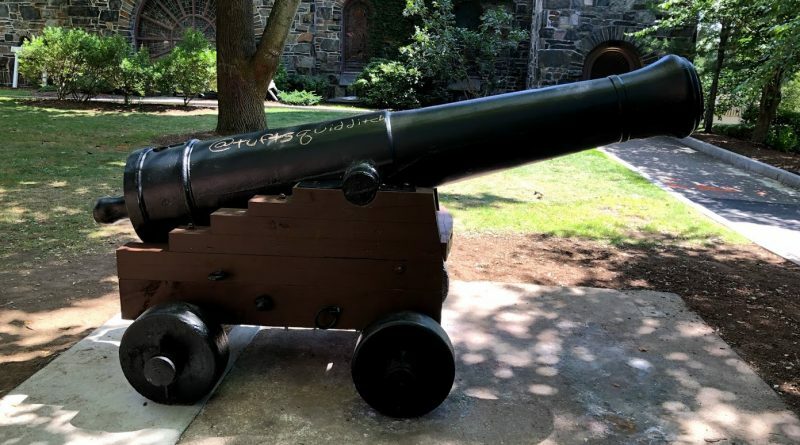 Among the many construction and grounds projects going on around campus this summer (known as “summer slammers,” in construction parlance) has been a cleaning and restoration of the cannon. I first noticed some workers chipping away at it with hand tools a month or so ago. 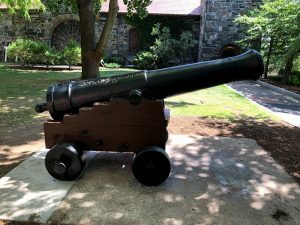 Quickly realizing the inadequacy of chisels for the job, they soon brought out some heavier hardware; it was a surprise when I next witnessed them going at the cannon with a small jackhammer of the type one might use to dig up a paved street to lay a new sewer. More surprising still was the snippet of their conversation I overheard a few days later, from which I learned that they had removed over 2,000 lbs. of paint from the cannon. That’s literally a ton of paint! Other things that weigh a ton: the average polar bear, a small car, and two copies of the winning entry in the 2012 Pennsylvania Farm Show butter sculpture competition. Now imagine any of these things made ENTIRELY OF PAINT. That’s right, all the individual layers of paint added to the cannon over many years are enough to make a pair of robot wine racks (one for reds, one for whites, natch). It’s fair to say that the cannon has been due for a reboot. This may be the only time you’ll ever glimpse it in its “original” black. 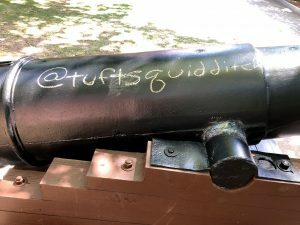 Congratulations to Tufts Quidditch for being the apparent first cannon taggers of the new era. But don’t get too smug, Quaffle heads; Fletcher is back in session, and we have a lot of orange paint.